Get ready to line up for all that extra white sauce, Chicago! 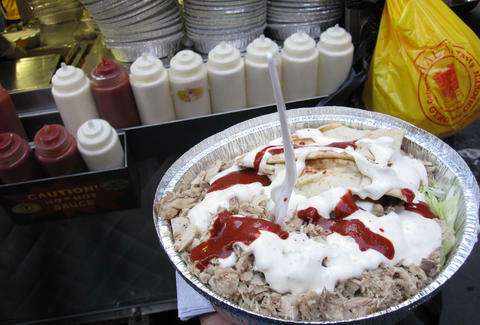 NYC's most famous purveyors of white and red sauce-covered street meats, The Halal Guys, is opening its first-ever Chicago location this June, to be located at 49 W. Division St in the Gold Coast neighborhood -- just about a block away from the Clark/Division Red Line stop, according to a report by DNAinfo Chicago. But unlike the Manhattan food carts that made Halal Guys famous (and attract hour-long lines for rice and lamb platters), the new franchise spot will be a brick-and-mortar restaurant similar to the two that opened in recent years in New York, according to the report. The Chicago location is the first of five slated to open in the city, DNAinfo reported, and comes as part of the Halal Guys's global expansion that includes plans to open franchise and corporate locations in Southern California, Houston, and even the Philippines. Tony Merevick is Cities News Editor at Thrillist and can't wait for the fog of that sweet street meat smoke to fill the streets this summer. Send him news tips at tony@thrillist.com and follow him on Twitter @tonymerevick.